Minnie’s Library? Who knew that Minnie Mouse had her own library collection? Minnie’s House in Toontown Fair is resplendent with details. I caught these book titles during my last visit. A few were in the living room and some were in the kitchen. Can you spot the titles that the books refer to? Some might be a little bit easier than others. 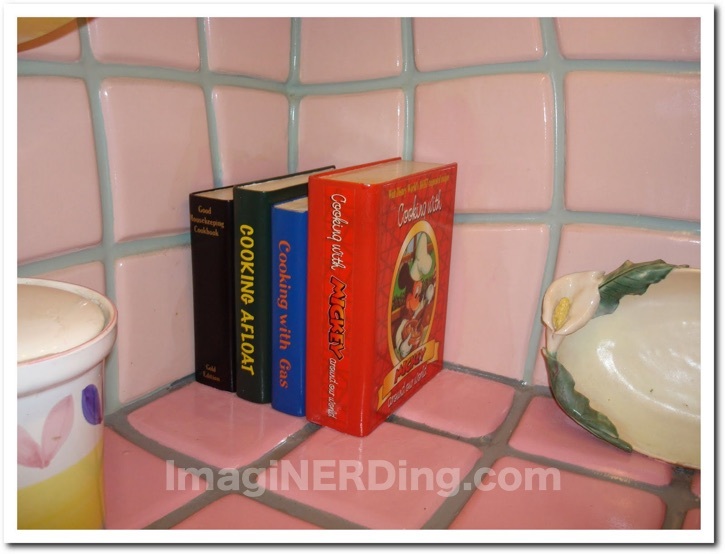 AJ at the fantastic Disney Food Blog has a more in-depth look at Minnie’s Kitchen. Cooking with Mickey Around the World. A real Disney book! Have you visited Minnie’s Library in her house? Those book ends in the first picture, “My Fair Mouse” and “The Wonder Ears” were actually sold at the Disney Store back in the 90s. My girlfriend (now wife) bought me the set for Christmas one year. Now, they proudly sandwich some of the books in my Disney book collection. Yep, I have them too! Though, I think mine came from Disneyland. There was also a bisque set, which didn’t quite look as nice- that bisque finish just looks hokey to me. 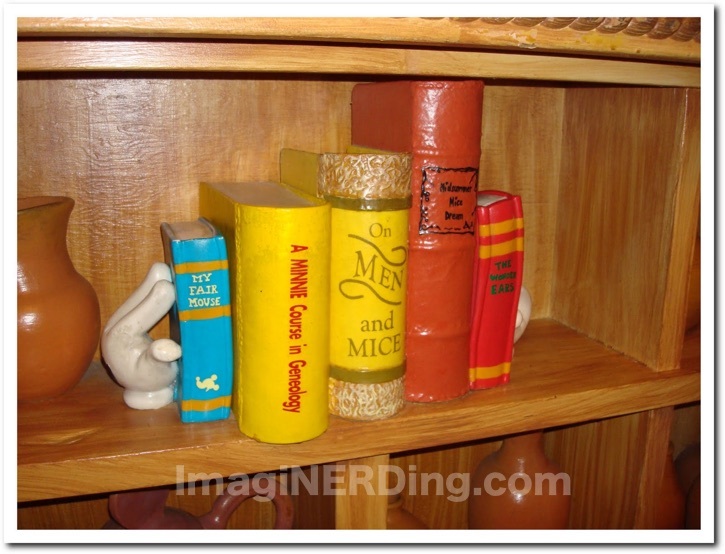 At Mickey’s House in Disneyland there’s a set that’s similar on Mickey’s shelf (the titles on the books might be the same) but the sculpt on the books and the hands are much different. I assume these predate (and probably inspired) the versions that were made for guests to purchase. Thanks for the mention, George! I love the in-depth looks at these houses; I’m hoping Mickey’s and Minnie’s abodes survive in some way after the Fantasyland reno.